"DK Readers" will help your child learn to read and encourage a life-long love of reading whilst learning about sharks. Encourage your child to read. 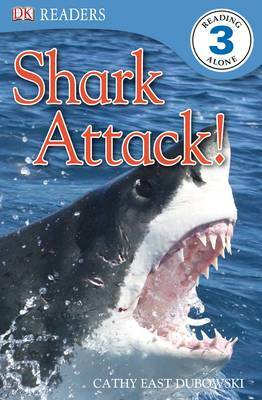 They will learn about how sharks attack people and how people harm sharks and gain insight into their behaviour. From encounters by divers and filmmakers to conservation issues, this is an exciting look at one of the most feared creatures in the sea. "DK Readers" are part of a five-level, highly pictorial reading scheme, with lively illustrations and engaging stories to encourage reading. Level 3 have a rich vocabulary, challenging sentence structure, additional information, and an alphabetical glossary and index to build literacy skills - ideal for children who are just beginning to read alone. Over 100 "DK Readers" are present in the series.